Hope just ... isn't likable. At all. I can't sympathize with her at all because of how she acts, alternating between entitled and smug. And this one has been around a while, but Luke Cage is nowhere near Namor's league unless he got several upgrades I don't know about. And even if he were, no way it would apply in the water. This is a guy who held off Thing, and has fought Thor, Hercules, and the Hulk and held his own -- Luke Cage is strong, but nowhere near that level (again IMHO, and potentially correctable if he was explicitly powered up somewhere). Just ... ugh. (no complaints with the post or poster, just that Marvel's events haven't been good for a long time IMHO). Marvel hasn't made a good events in years. As I post, this is my first time reading this event and my god, it's bad. It's not Axis bad, which is an abomination of a comic book event (the worst I ever read by a mile), but this is just stupidly bad. Everyone is either an idiot or a douchebag in this book and not even being that knowledgeable about the Marvel-verse, I can tell that they're getting things wrong. 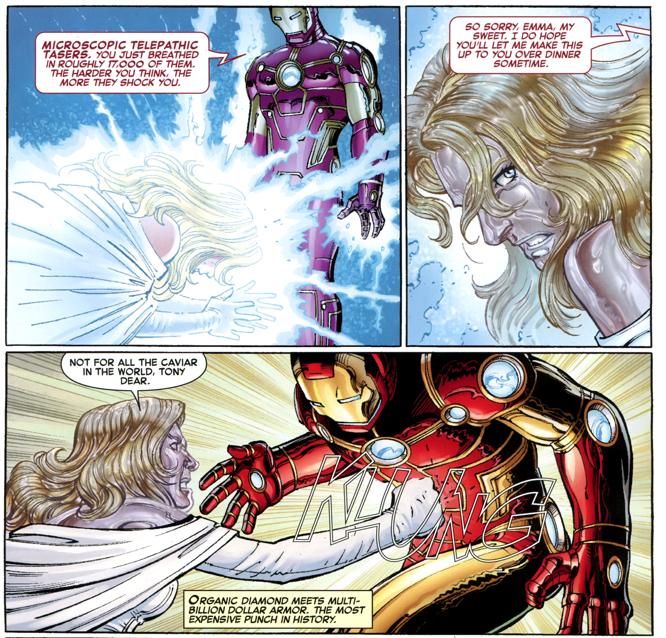 You mean you haven't gotten to the New Avengers tie-in with the Iron Fhoenix yet? I liked Siege. 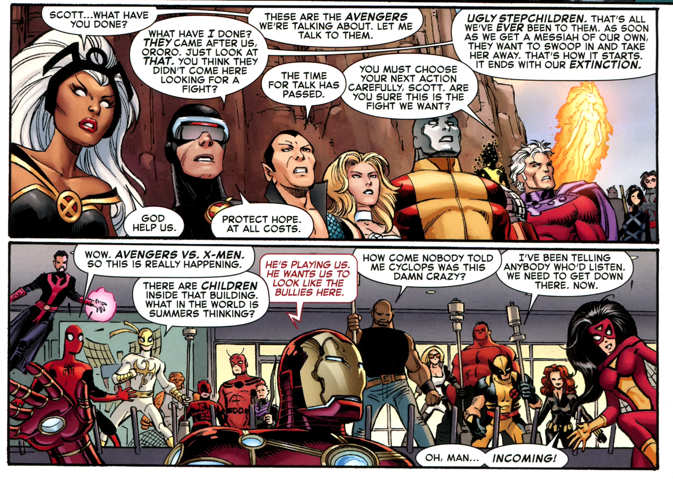 Dark Reign was bad because villains were on the run, but I did like Dark Avengers vs. X-Men, and I did like Siege. And Chaos War. 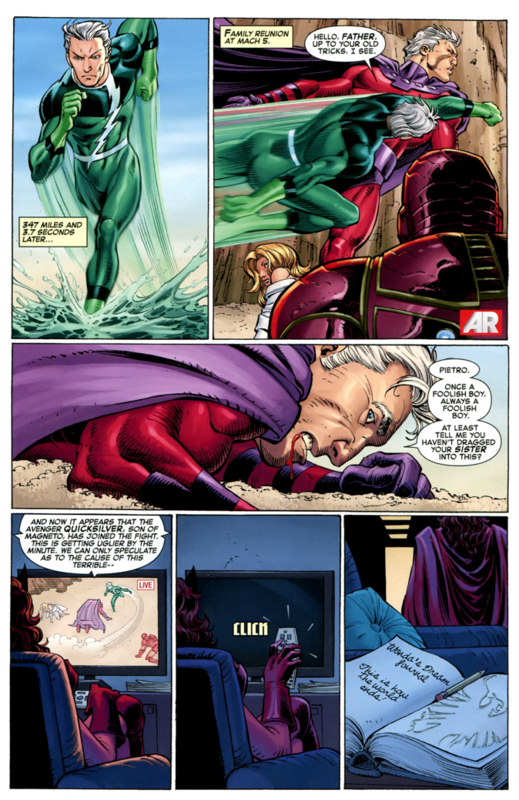 I didn't read the main story of Fear Itself, it had it's flaws too, but most tie-ins were awesome. 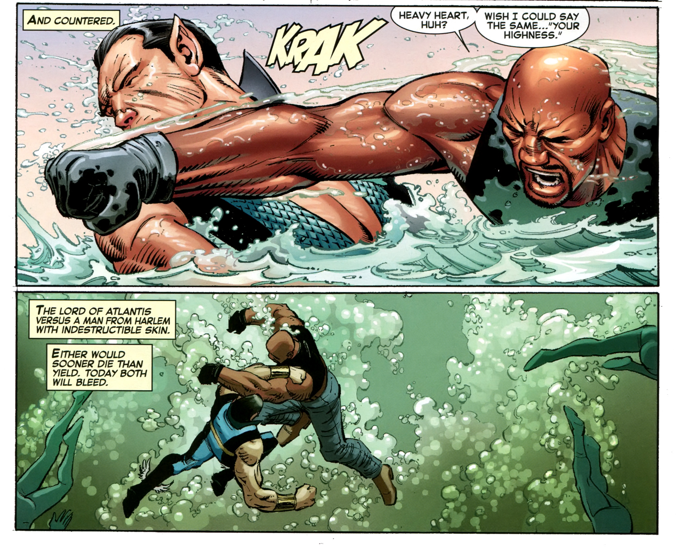 Oh yeah, Namor vs. Luke Cage in the water. On top of every other problem, this series is a feats nightmare. 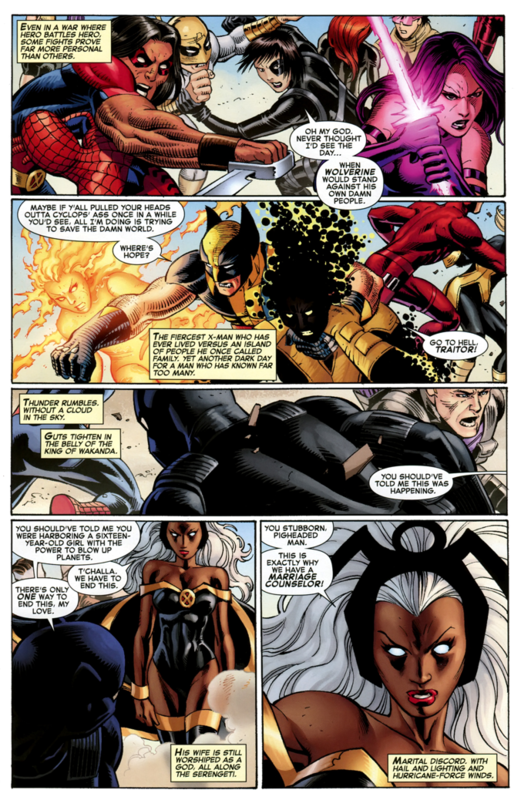 In that group shot, you've got Wolverine handling both Magma and Sunspot. 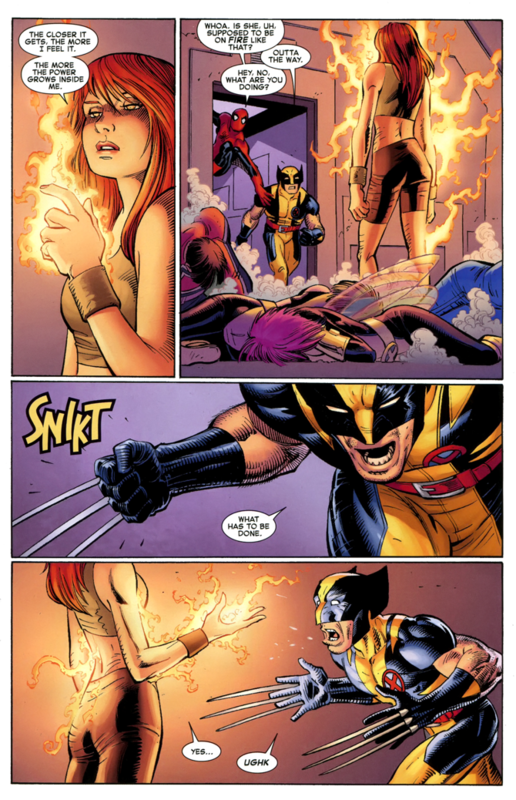 Magik vs. Daredevil. 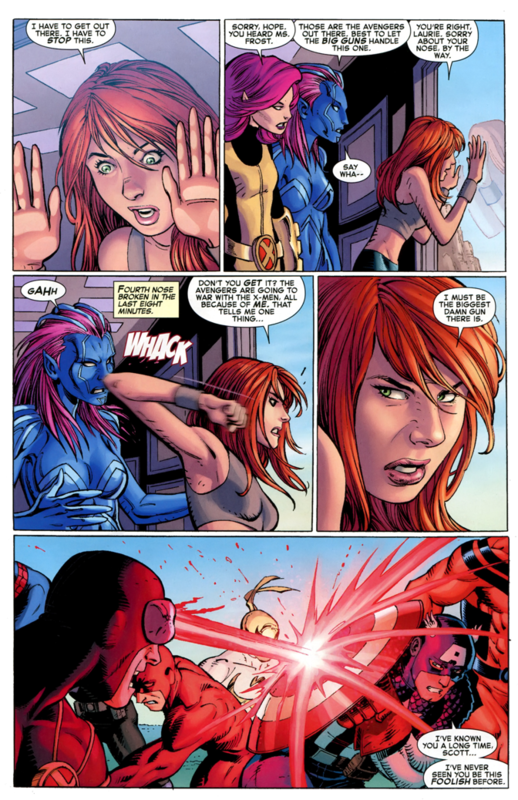 Black Widow vs. Jubilee. And it keeps going like that the whole series. And I agree on Hope. She just never worked, IMO. I don't see a problem with stuff like that because they're just moments, snapshots, in a larger fight. It's not like it's saying Daredevil defeated or even held his own for a significant time against Magik. Just that, at some point in the chaos, those two were fighting each other. And Wolverine actually holding Sunspot in a headlock. Sunspot IS in Cages league. Damn, that is some hilarious spin doctoring in that quote. I liked "the most expensive punch in history." Except it was probably trying to be serious rather than funny. I'd write it as "Estimated cost: 138 Kajillion Dollars." I got all the arguing of the rights and wrongs of this fight out of my system earlier, so I'll just say that I like the very droll narration ("the first of the day's concussions, the most expensive punch in history," etc.). It doesn't really work for Wanda, Storm or Black Panther, though, whose motives are barely comprehensible at this point. I prefer "bored couch potato" Wanda infinitely in comparison to every other version. I think what truly makes this event stand out among other events is that many of them had good concepts, badly handled. 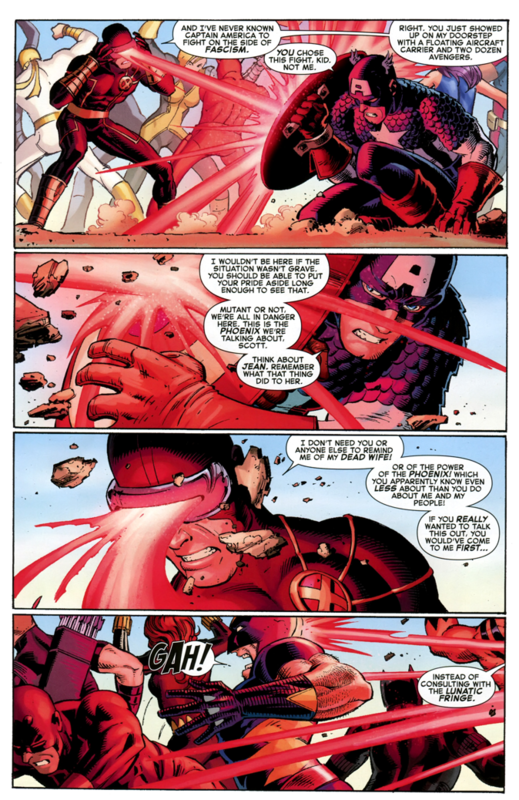 Civil War, Secret invasion -> Dark Reign -> Siege... Inversion even. This one was terrible in concept and worse in execution. 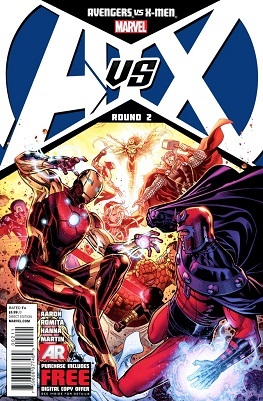 It really seemed about having the Avengers decisively take over the X-mens crown.